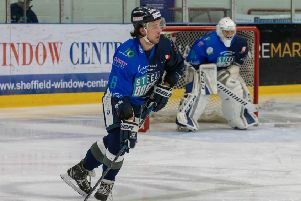 JASON HEWITT hailed his special 'band of brothers’ after Hull Pirates turned on the style to beat arch rivals Sheffield Steeldogs to win the NIHL North One title. 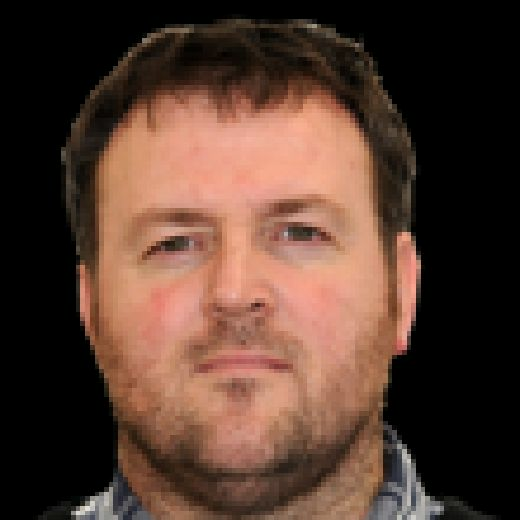 Sunday night’s emphatic 8-3 victory Ben Morgan’s side was, in a way, payback for 12 months ago, when the Steeldogs won the championship in Hull’s rink on the last day of the season. But this time, it was the turn of Hewitt and his players to inflict misery on home ice, never letting their foot off the gas after racing into an early 2-0 lead with just over six minutes on the clock. The Steeldogs rallied and by the end of the first 20 minutes were just 3-2 behind. But two early goals in the second period from the visitors seemed to knock the stuffing out of the hosts, with the Pirates easing to a comfortable victory. “It’s an unbelievable feeling it is what we set out to do,” said Hewitt, whose team were cheered on by a raucous travelling support. Hull Pirates' players and staff celebrate their North One league title triumph. “And to get it done in this building and with that scoreline too, to dominate like we did, it’s such a great credit to all of those players. “Winning this trophy is as sweet as any I’ve ever won. What happened last year helped us in two ways, both in terms of motivation and in terms of us learning from it. Tonight we showed we had learned how to win in these kind of games - when it really matters. James Chilcott’s opener at 6.14 got the ball rolling for Hull with a second coming just 28 seconds later from Lubomir Korhon. Sheffield responded quickly through Andrew Hirst but, to cap a mad 75 seconds, Hull restored their two-goal lead through Bobby Chamberlain at 7.29. Ashley Calvert got on the board for the hosts to make it a one-goal game again but two strikes early in the second - the first a bizarre goal that saw the puck cannon off the back of Steeldogs’ netminder Dmitri Zimozdra’s skates - put Hull back on top, Chamberlain’s second coming at 23.50. Calvert’s second made it 5-3 but a superb shorthanded strike on a breakaway by Korhon restored restored Hull’s superiority. 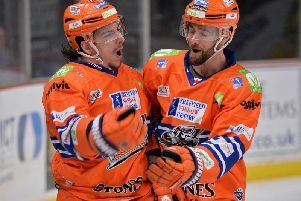 In the third, a fine individual effort from on the power play from Sonny Karlsson and a Lee Booner strike ensured the title was Hull’s. An understandably disappointed Morgan afterwards stressed his players would bounce back qucikly in order to finish the season on a high by trying to clinch the playoff title. "We're obviously disappointed with the result, especially with the scoreline," said Morgan. "I don't think we had much puck luck, I mean if you watch another 100 games of hockey you'll never see another goal like their fourth one. "And while I'm not saying that was a defining factor, it certainly gave them the momentum back. But credit to Hull, they took their chances and we've built up a really good, fierce rivalry with them over the last few years and long may that continue."